Bozeman Magazine spoke with playwright Greg Owens, who has lived and written in Bozeman for nearly 20 years, about an upcoming milestone in his career and how he’s gathering with friends and family at Verge Theater to celebrate. Bozeman Magazine: We understand you’re marking your 30th year of playwriting. That’s quite an accomplishment! What does that mean to you? Owens: It not only means that you can grow up in a trailer and become a published playwright, it means you can do that exactly how, with whom, and where you want. When (wife) Lila was mugged in Chicago and we moved to Bozeman, I figured I’d maybe end up starting a landscaping company or having my dream job at Cactus. I didn’t envision my playwriting career not only continuing but expanding while I built a life and family as part of this community. At the same time, I have this far-flung community of collaborators and supporters who have invested their energy, time, and money into taking a chance on things I’ve written over the years — small companies, many now defunct, storefront outposts of artistic risk and the original word, people of passion and commitment who helped make it happen just because they liked the work. No matter how much I love to make up characters and tell odd stories, I wouldn’t still be doing it without all the other people who make it possible and meaningful. BM: Tell us more about that. How is your voice and/or your collected works unique? Owens: I’ve felt like an outsider in nearly every room or situation I’ve ever found myself in. I was the Creative Freak in Redneck Town and then I was the Hick at University Land, the Indiana guy in Chicago and then the Chicago guy in Montana. If my fellow Hoosier Kurt Vonnegut’s Billy Pilgrim was “unstuck in time,” I feel unstuck in socially constructed identity. I’ve always been the one of these things that’s not like the others. But that experience has developed in me the instinct to seek common ground with all people I encounter (or imagine) on a direct personal basis, outside of socially determined roles or labels. There’s always something at least slightly improbable about my plays — therapy sessions with Bigfoot, Grim Reaper negotiations, etc. — but I think at their best, they’re surprising little slices of life that make people think and/or laugh because they come at everything from just a slightly different angle. BM: Very cool. Speaking from that slightly different angle, what have you learned over the decades? Owens: (1) Be ready for unforeseeable circumstances to change all your plans and radically alter the course of your life, and trust that this is more of a gift than a hassle. (2) Accept that some people will eat your food then stab you in the back because that’s what they are. (3) Know that you’d rather be that person’s victim than live with their karma. (4) Believe that you can learn something from everything that happens and everyone you meet. (5) Make every effort to enjoy what you do with your time on Earth. (6) Take care of yourself, but live for others. BM: What is left unfinished for you? Owens: Other than a couple of backyard projects and a heavy metal musical about a high school dropout who talks to God, the main unfinished thing I’m focusing on right now has to do with passing it on, sharing things I’ve learned that might help others like so many have helped me. I believe that writing plays can empower young people to express and understand themselves, not in a squishy feel-good way, but in terms of being able to analyze how conflict situations develop and escalate and how they can wield the power of intentional choice to effect outcomes in different directions. It’s easy in the theatre world to get hung up on your ego and perform an image of yourself, so other people think of you a certain way, and when we’re on that train we miss the boat. The creative process is inherently about empowerment and awakening, self-discovery and connection, imagining and doing. I believe it’s what makes us occasionally human. I’m interested in trying to keep ego and social constructs like “hierarchy” and “success” out of the equation and focus on skills and techniques that help people access and use their creative potential with intention and self-determined purpose. I’m particularly excited about the upcoming Verge teen-playwriting workshops I’m teaching this winter and spring and in the idea of supporting the creativity of others in general. BM: Speaking of Verge Theater, you’ll be marking your 30 years of playwriting with an event the Saturday after Thanksgiving at 7p.m. : “Incongruous: Short Works by Greg Owens.” What can attendees expect from this event at Verge? Owens: The short plays and the acting ensemble are connected to a project called the High Country Drama Podcast. We do first-take cold readings of new scripts. The idea is to present that first point of contact between performer and material, the spark that comes off the page for them as they jump into the words and interpret their roles on the fly. In a full production process, these are the rough and beautiful moments that get beaten, crushed, and worked to death in the pursuit of a polished final product. This event is about actor and word, and I’m fortunate to have not only my whole family but also some of my favorite collaborators breathing life into my words on stage with this cast, which includes Kent Davis, Kari Doll, Bennett Drozic, Lila Michael, Eiseley and Lorelei Michael-Owens, Alex Miller, and E.J. Porth. BM: I understand this event is a fundraiser. What will Verge do with the proceeds? Owens: Bury it in a can with the others under the giant anvil in front of the Midwest Building. The proceeds will go to Verge’s education program which includes acting/production and this new teen-playwriting class we’re piloting. This reading and the playwriting program have both arisen from a very positive dialogue I’ve had with Verge’s Executive Director Hilary Parker and Programs Director Jessie Sherman. I’ve found a lot of common ground with them in terms of looking at youth theater as personal development and civic education. It shouldn’t be about whether kids grow up to be on Broadway or whatever but all the incredibly positive lessons and personally validating experiences that can come from collaborative creative effort. My nine years as Executive Director of the Bozeman Youth Initiative hipped me to the importance of hands-on autonomous experiences for youth. This event is meant to get the community wheels turning on the playwriting process as we seek to elevate awareness and appreciation of the form and the craft while exploring its potential for empowerment of the youth community. BM: Love your focus on the next generation. What advice would you give young people interested in playwriting? Owens: Learn all the jobs of the theater. Study what each person does and how they work within the production team. Understand the mechanics of theater as much as you possibly can: build and paint sets, hang and focus lights, make props and costumes, write a press release, clean the bathroom(s) on opening night. Get your hands dirty. Know and respect the work. Be suspicious of people who seem to have agendas other than the work. Cults of personality are still cults. Judge people with verbs and not adjectives. Be ready and willing to invent the theater you imagine if it doesn’t already exist. 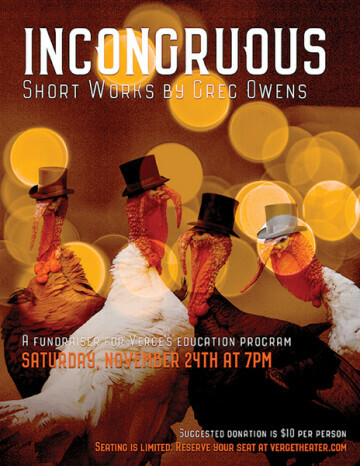 Note: Tickets for “Incongruous: Short Works by Greg Owens” are available at VergeTheater.com. The event is free (with a suggested donation at the door of $10 per person) but seating is limited. Reserve your seat today!